You need to have enough money that is genuinely available to you to pay for your course fees, travel and living costs for you and your accompanying family members while you are in Australia. If you are coming to Australia for a short course, you will only need to show evidence of funds for the intended period of stay. Provide evidence that you meet the annual income requirement. Provide an Acceptance Advice of Secondary Exchange Students (AASES) form (secondary exchange students only). Provide a letter of support from Department of Foreign Affairs and Trade or Department of Defence. If you are using the 12 months fund option to demonstrate financial capacity, an accurate calculation of funds is required. Below is an outline of the funds to calculate. The type of evidence includes money deposit or loan with an approved financial institution, government loan, scholarship or sponsorship. The annual income option requires students to provide evidence of personal annual income of at least AUD60,000. For students accompanied by family members the amount is AUD70,000. The income demonstrated must be the personal income of your spouse (who is not travelling with you) or parents. In circumstances where both of your parents are working, their combined income can be considered for this requirement. In all cases, the evidence of annual income must be provided in the form of official government documentation, such as a tax assessment. Where our online application system indicates that documentary evidence of financial capacity is required, it is important that you attach these documents to your visa application prior to lodgement. Failure to do so may result in visa refusal. You and your accompanying family members must demonstrate that you will have access to the funds while you are in Australia. When another person or business is providing funds, show evidence of the relationship and any history of financial support provided to the student or any other students. It is also good practice to provide identity documents for the person providing the funds or evidence that the business is currently operating. If relying on a money deposit, any recent large deposits must be explained. You may also consider explaining ongoing deposits – like wages. If you have an education loan to cover tuition fees or living expenses (such as accommodation) disbursement should occur according to the agreement between the bank, provider and yourself. Evidence of any disbursement which occurs before the visa application has been finalised, should be provided. Evidence of the terms of the loan and the full amount of the loan that will be disbursed should be attached. Providers should be aware of the conditions placed on the education loan. Some loans offer deferred repayment against future earnings of the student and are conditional on the student studying only the stipulated course as that provider. If you are relying on another type of loan, you may consider showing evidence of collateral used to get the loan, the terms of the agreement and capacity to cover ongoing costs. The best evidence of genuine access for a loan is full disbursement. Example 1: if your course fee is AUD50,000 for three years, determine the fee for one year (12 months) by dividing the total amount by the number of years. The amount will be AUD16,666. Deduct any pre-paid amounts. Example 2: If your course fee is AUD15,000 for ten months, and you have already paid AUD5,000, deduct this prepaid amount from the total amount. The amount will be AUD10,000. Example 3: if your course fee is AUD20,000 for 18 months, determine the fee for one year (12 months) by dividing the total amount by the number of months, then times by 12 (20,000 / 18 x 12). The amount will be AUD13,333. Deduct any pre-paid amounts. Where school aged children are included in your student visa application, schooling costs of AUD8,000 per year for each child will need to be added to the amount of funds that is required. 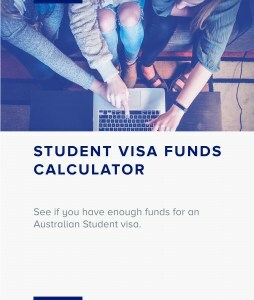 This amount is the minimum required for a visa application only and you are responsible for researching schooling costs, which may vary widely between states, territories and schools in Australia. received an Australian Commonwealth Government scholarship, including Foreign Affairs and Defence sponsored students, and you can show you have enrolled your child in a government school where the fees have been waived. If applying outside Australia, include AUD2,000 (except if applying from East or Southern Africa, include AUD2,500; West Africa include AUD3,000). If applying in Australia, include AUD1,000 (except if returning to Africa, include AUD1,500). 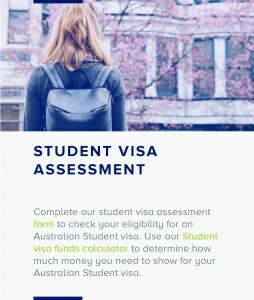 Family members of existing student visa holders will need to apply for a subclass 500 visa if they do not currently hold a student visa and wish to join you in Australia. Generally, the same level of evidentiary requirements of financial capacity applied to primary applicants (students) would apply to your family members, including subsequent dependants. In all circumstances, our officers have discretion to ask for further evidence of funds, if required. 75 per cent of complete student visa applications are completed within one month of lodgement.